Persons interested in investing in stocks should open an account at a brokerage company so they can start investing when they decide to take the plunge. Stocks are not like fixed interest securities where the returns are usually known, up front. Put another way, there are no guarantees about the returns on stock market investments, that is a negative. History shows it to be a huge positive with no limit to possible gains. The basic principle is to find companies that are likely to increase profit going forward. This is most important, as profit are the main reasons why investors buy a stock, as it increases the value of a company. 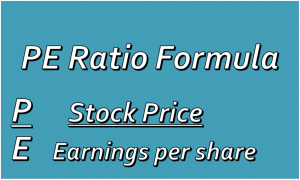 Buy stocks with low price earnings (PE) ratio relative to the rest of the market. What does this mean? Listed companies are required to report profit and show the amount of profit earned per share (EPS). EPS is the profit for each issued share. In simple terms, the EPS is arrived at by dividing the profit by the total issued shares. This figure by itself does not mean much, but it allows for the computation of one of the most important and used investment tools, the PE ratio. PE is the price of the stock on the stock exchange divided by EPS. Do not buy stocks because the price is low in monetary terms. Instead, have laser like focus on stocks with lower PE ratios. Sometimes when persons buy shares, also called stocks, they may see quick gains, as may happen with the Wigton Windfarm initial public offer (IPO) issue that is now on the Market. More often, investors will not see any gains for months but then may do so with the passage of several months, if the company reports increased profit. Effectively, if one buys stocks of good quality companies they will usually grow in value. A good quality company is one that has consistent growth in earnings over a number of years, with few if any decline. There is more to it than the above, but these are a few basics. New investors are well advised to start small until they get a better feel of the market. Yes, you can start with $10,000, but $25,000 may be better. Investors can find the earnings per share EPS and PE ratios for each local stock, on the stock market trading chart shown daily and included in the Junior and Main market reports. The key to using them is to find those stocks with the lowest PE ratios and get more information on them. 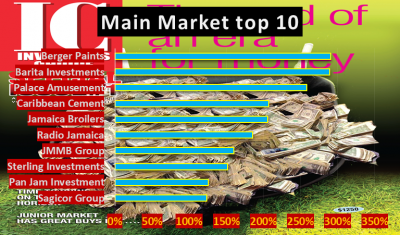 This website analyses the companies on an ongoing basis to provide relevant investment information for investors. The stock market combined index climbed from 82,934.95 points at the end of 2013 to 324,801.52 on Friday, for increase of 292 percent but the average PE ratio has moved from 7.3 by just under 100 percent to peak at an average of 14.5 times last year December. During the same period, Treasury bill rates tumbled 75 percent from just over 8 percent to 2 percent or were 300 percent more than they are now. 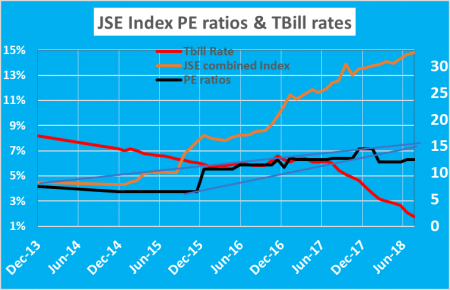 While the fall in interest rate would appear to be close to the rise in the market index, the much slower increase in the PE ratio indicates that the major part of the rise is due to increased profits. 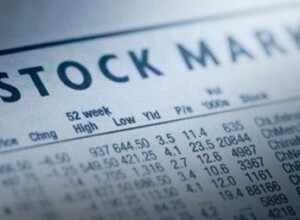 Based on the trends in interest rates and PE ratios, coupled with the serious shortage of supply of several stocks, currently, the PE ratio of the market will rise from the current level of 12.5, first to the high of 14.5 reached at the end of December last year and should move on to around 17 to 18 by the end of the year or early 2019. A look at the chart, indicates that investors are more cautious in moving stock valuation higher. 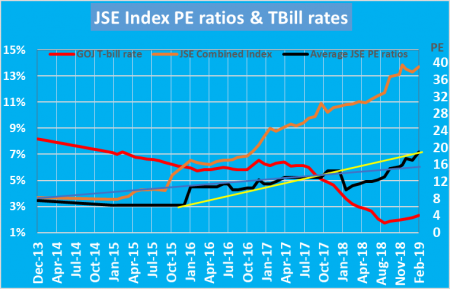 The PE ratio seems to be moving higher each year since the sharp jump in 2015, suggesting that the increase in PE is not yet over. The other factor is that interest rates have fallen faster in 2018 than for some time, investors seem to need more time to digest the rapid change in rates and determine how long it likely to remain at very low levels. The big question to come will be, when will interest rates start to reverse? If the PE hits 17 by year end, it would represent an approximate 35 percent increase from current levels. Quite a number of stocks are selling above the average of 12.5 presently. 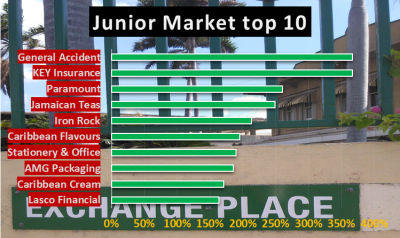 A total of 24 stocks in both markets trade above 12.5 and 7 each in the main market and Junior Market selling above 16 times current year’s earnings. Berger Paints annual report had some good news for investors to digest. 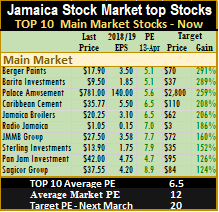 The up and down nature of the markets this past week left most stocks fairly stable resulting in no new entrant to the TOP 10 list of stocks on the Jamaican Stock Exchange. The past week got greeted by a series of company results that were not inspiring with most reporting lower profits for the first quarter this year. On a positive note, most of the results were affected by increased cost resulting from expansion ahead of full flow of new income from the expanded facilities. Companies affected include recently listed Elite Diagnostic, Paramount Trading and Knutsford Express. Berger Paints released their annual report that was filled with some good talk of going after market share, new product lines to be added and upgrading of equipment to increase efficiency. “The outlook for 2018 and beyond is extremely positive. The Berger brand remains strong and continues to dominate the local market with strong brand equity and a reputation for quality. With GDP projected to grow by at least 1.5% in 2018, construction activity and the demand for coatings is expected to remain relatively strong for the next two to three years. Plans are already being implemented to expand the company’s local distribution and product range as well as to improve our level of customer service and responsiveness. In 2018, there will also be greater emphasis on building out exports by targeting new markets in Central America and the Greater CARICOM region,” the Managing Director reported. For Palace Amusement with the bid at $781 at the close of the week down to $750 the movie Black Panther continues to pull in the crowd after two months of showing and still has two showings per day in all three cinemas, the same as shows that opened during the past week. Barita Investments rose to close the week at $9.50 as investors sucked out most of the supply under $10. Key Insurance fell to $3 as the company reported that two directors sold shares during the week, while JMMB Group gained more ground, as the block out period for insiders to trade in the stock, comes to a close, until after mid May. At the close of Friday, the average PE ratio for Junior Market Top stocks ended at 6.2 compared to an average PE for the overall main market is 10 based on 2018 estimated earnings. The main market PE remains at 6.5 for the top stocks, compared to a market average of 12.3. IC Insider.com’s TOP 10 stocks now trade at an average discount of 39 percent to the average for the Junior Market Top stocks but it’s a third of what the average PE for the year is likely to be of 20 times earnings and main market stocks traded at a discount of 47 percent to the market. 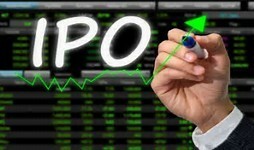 Is trading IPO issues a good idea? The question of the week comes from one of IC Insider.com’s readers. “ I’m trying to understand more about investing and would like to know about buying stocks at the IPO price, selling when they go up and then buying when the prices settles lower? Does it make sense to do so? The answer to the question is yes and no. it can be done but understanding where the stock may top out initially, is going to be the key. You have to determine the price to sell at and then identify when to get back in, as well as where the price may go after reentry. Those targets are not always easy to assess. A good example is Main Event, it went to $5 early after listing and then pulled back a bit and went over $8 and pulled back to $4.85 last Week. Express Catering went over $5 initially and pulled back to $3.80, traded recently at $5.60 and pulling back again. Trading fees can cost up to 5% to get in and out that needs to be factored into the equation of potential trades as well. Knowing the PE and how the stock compares to others in the market, will help a great deal to determine the likely top for a stock. The use of PE ratio and comparing them with other stocks gives a good indication which stock has a better valuation, but it may not tell when that difference will be eliminated. Currently, just below 20 times current earnings, seems to be a good exit point as the target for IPOs and say 20% or so below could be a good reentry point. Picking tops and bottoms in markets is not always easy, unless historical records are used in the assessments. This technique is better known as technical analysis where markets or products, in this case stocks, establish set price patterns over time, often trading within what’s called a channel. Channels allow investors to better pick tops and bottoms, while the items is trading within the channel. Three directors of Main Event, including the mentor who is respossible to ensure compliance with teh JSE rules. 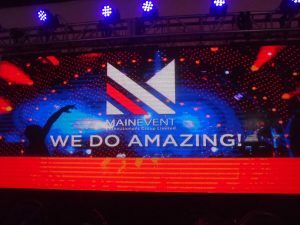 The 2017 junior listed Main Event Entertainment, made a loss in the last six months of the 2016 fiscal year, ending the year with a profit of $56 million, down from $64 million for the six months to April. The latest figures from the entertainment company for 2017, show a profit of $75 million for the half year and $51 million for the April quarter. The figures reveal seasonal differences in the operation, with higher revenues and profit in the first half and lower revenues and losses or minimal profit in the second half. The Jamaica Stock Exchange rules require that seasonality in operations is to be reported on, in a listed company financial report. There is total silence on this issue in Main Event’s report, leaving investors to guess what the second half will be like, it should not take the stock exchange rules to put to this. Good investors’ relations suggest that this is absolutely needed in this situation of wide variation in the two periods. Astonishingly, a review of the company’s prospectus gives no indication of seasonality of revenues and earnings. The directors’ report accompanying the half year results, speaks to a reduction in direct expenses due to continued investment in fleet and transportation solutions, and rental equipment and human resources. At the same time administrative cost had a big increase due mainly to increased transportation and fleet management costs. It appears that these added costs should be treated as a part of direct cost and not administrative. Revenue in the April quarter at $319 million was flat with the 2016 out turn but the half year rose 8 percent to $652 million. The data to date show no indication that the second half year results will show much if any improvement over the outcome for 2016 except for the removal of taxes. At the initial public offer in January the issued share capital was 240,004,000 shares and 60,001,000 shares were issued to the public, resulting in an average number of shares issued for the April quarter of 300,005,000 units but only 270 million units for the half year. The report shows the fully issued number of shares at the end of April is used in computing earnings per share (EPS) for all periods. The effect is that the reported in the interim results are wrong and in effect understated as the number of shares used in the computation is overstated. Instead of earnings per share of 25 cents for the half year it is 27.7 cents and for the 2016 period 26.8 cents and not 21 cent. The earnings for the 2016 April quarter, is 17.2 cents and for the full 2016 fiscal year 23.5 cents. There are clearly weaknesses in the report and its handling, but worse it is also showing weaknesses in the overall management inclusive of the directorate. The company expended over $107 million on fixed assets, increased borrowed funds by a mere $10 million more than at the end of October with cash ending at $65 million from just $19 million at the end of October. With the interim results ending at 28 cents per share, it is going be challenging for earnings for the full year to be much higher than 35 cents IC Insider.com is forecasting for the year to October, barring a sizable rise in revenues. It could go on to earn 50 cents for 2018, IC Insider.com’s forecast shows. 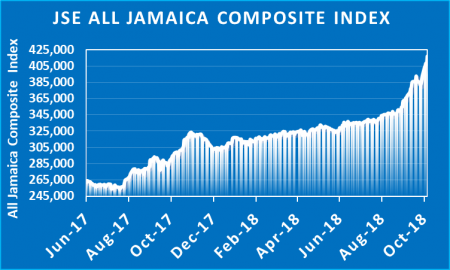 At the current price of $6 on the Junior Market of the Jamaica Stock Exchange the PE ratio is 17, suggesting that the price may revolve around this level for a while. Honey Bun shot up by more than 500% in 2016 shortly after stock split. 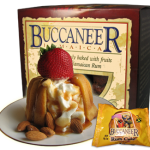 Junior market listed bakers, Honey Bun, is enjoying a glorious period of surging revenues and profit that fueled a huge jump in the stock price of 355 percent for 2016, after rising over 500 percent, earlier in the year. In continuation of a successful year, revenues climbed 36 percent in the third quarter of financial year to June, spawning a 124 percent increase in profit before taxes to $38 million over the June 2015 quarter. Revenues climbed 35 percent to $903 million for the nine months to June, up from $672 million in 2015 while profit jumped 109 percent to $138 million before tax and $132 million after tax of $6 million. Gross profit for the nine months climbed at a faster pace than revenues, at 40 percent while for the quarter, gross profit rose 34 percent, just below the growth in revenues for the quarter. Expenses excluding cost of sales, rose even slower than revenues, at 20 percent, with administrative expenses rising sharply by 33 percent to $147 million and selling and distribution costs increasing by 10 percent to $104 million, while depreciation rose by 4 percent to $28 million. For the June quarter administrative, selling and distribution expenses rose at a slower pace than for the nine months, at 12 percent. The company generated gross cash flows of $171 million for the nine months, before expending $75 million on the acquisition of property, equipment and fleet. Honey Bun is in a healthy state with cash balance and investments at $104 million after the company repaid $38 million in long term loans, leaving loans at $16 million. Current assets stood at $212 million and current liabilities ta $71 million. Shareholders equity climbed to $491 million. The Company that listed on the Jamaica Stock Exchange Junior Market in June 2011, is now subject to taxation on profit for the next 5 years at 50 percent of the normal corporate income tax rate of 25 percent. Earnings per share for the quarter came in at 8 cents and 28 cents for the nine months. IC Insider projects 34 cents or $160 million for the full year to September, with $147 million or 52 cents per share projected for 2017. 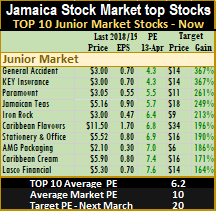 The stock traded at $5.60 on the Jamaica Stock Exchange junior market for a PE of 16.5 times 2016 earnings, making it one of the highest valued stock on the market. The stock was accorded a BUY RATED ranking in November 2015 but has since been placed on a watch list when it shot to over $7 per share. 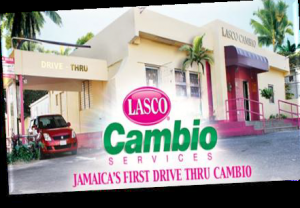 Lasco Financial Services reported profit of $191 million or EPS of 15.5 cents for the March 2015 year, an improvement of 8 percent over the $177 million made in 2014. The last quarter was poor with only $10 million in profit, down sharply from $41 million made in 2014, due to a combination of developments. Revenue for the last quarter hardly grew, ending at $148 million versus $145 million in the 2014 quarter while expenses grew by $28 million due mainly to increased spend on marketing and selling expenses. 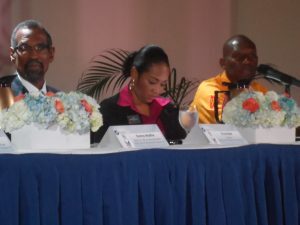 Jacinth Hall-Tracey, Managing director indicated that the period suffered from squeezed margins on foreign exchange trading and foreign exchange losses in the quarter, resulting from the revaluation of the Jamaican dollar and greater stability of the exchange rate. Loan disbursements slowed as credit rating data used in assessing potential clients resulted in lower loan approvals. 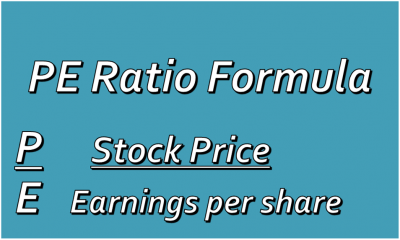 The PE ratio of the stock is 13 based on the last reported earnings, normally the ratio would not be that high. Mayberry’s acquisition of 20 percent of the company’s shares has changed the dynamics and remove some supply from the market. The company has cash of $500 million and is generating over $200 million per year. If the company can find the formula to ramp up good quality lending successfully, the profit outlook can be transformed considerably with high profit margins for lending. “We are working on a number of initiatives that will help in the transition from lower income in foreign exchange activity” Hall-Tracey said. The area of credit approval is one that they is being revisited as the use of credit rating information is stymying lending. 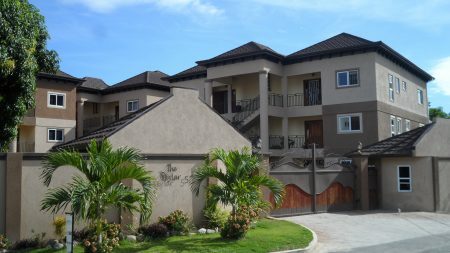 But Hall-Tracey expects profit for this year that ends March 2016 to be higher than for the year just ended, subject to taxes on profit which the company will start bearing at fifty percent of the official tax rate of 25 percent. The equity capital of Lasco is $812 million and is well below that of its two siblings who have equity in equity of more than $2.4 billion each. The company has done well from the money remittance and cambio operations but it is in the lending that the future growth prospects seems to rest. Hence the connection between Mayberry with the know-how having been exposed at Access Financial. The company has the free capital to increase lending with only $147 million in loans at March.